Daily commute is a big challenge in most of the urban cities where public transport systems are jammed with roads blocked most of the times. Amidst all of this, it is nearly impossible for urban dwellers to be able to travel for short distances as rickshaws and cabs do not go for shorter distances, and even if they do go, they charge higher fares. People might end up paying higher fares to them because of this issue. Conclusion of this situation is that urban people end up paying higher rates than they should, which itself is an issue. Bike sharing app like Mobycy is a smart solution to this problem. Dockless bike sharing frees up users from a big hassle of first locating a stand to find an idle bike, then finding a parking station after having reached the destination. If someone has to walk from the parking station to final destination, it defeats the entire purpose of having a last mile solution. Mobycy has developed an indigenous solution for short distance travels in cities. 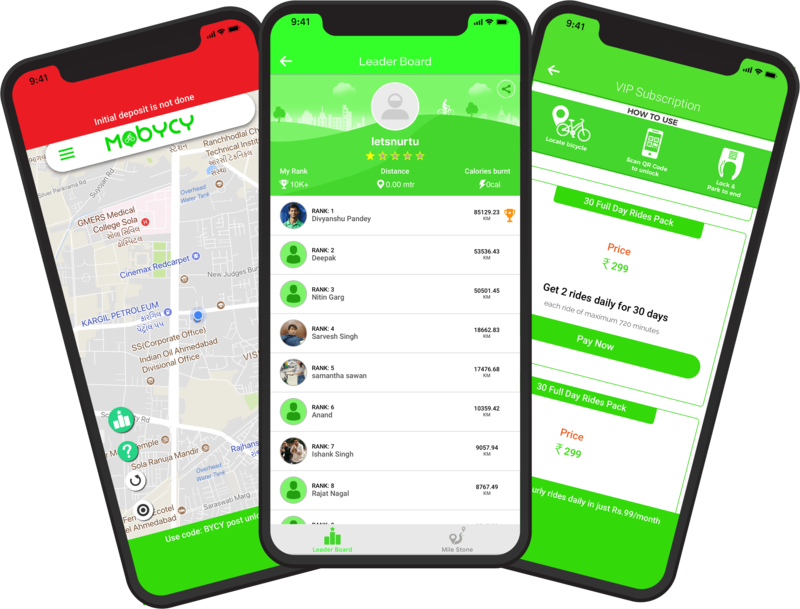 Mobycy is India’s first dockless bike sharing app. Why walk in sweat when you can ride in style! Mobycy allows users to simply download the app, locate a Mobycy bicycle near them, unlock it and go for their rides. The best part is – users can park it anywhere they seem fit, as far as it is parked properly in a public space. In addition to being dockless, Mobycy bikes are very affordable since they can be accessed for as low as Rs. 5 for 30 minutes, along with a small refundable deposit. Mobycy is still in the initial stages of its business model, though it is completely scalable which is depicted below. Per Ride Revenues: The minimal fees charged for renting a bike. Monthly/Weekly/Annual Subscription: This revenue will come from daily commuters who want a subscription based plan. Brand Partnerships: Having large data of target customers, Mobycy can opt for brand partnerships for geographic targeting based ads and collect revenues on the same. 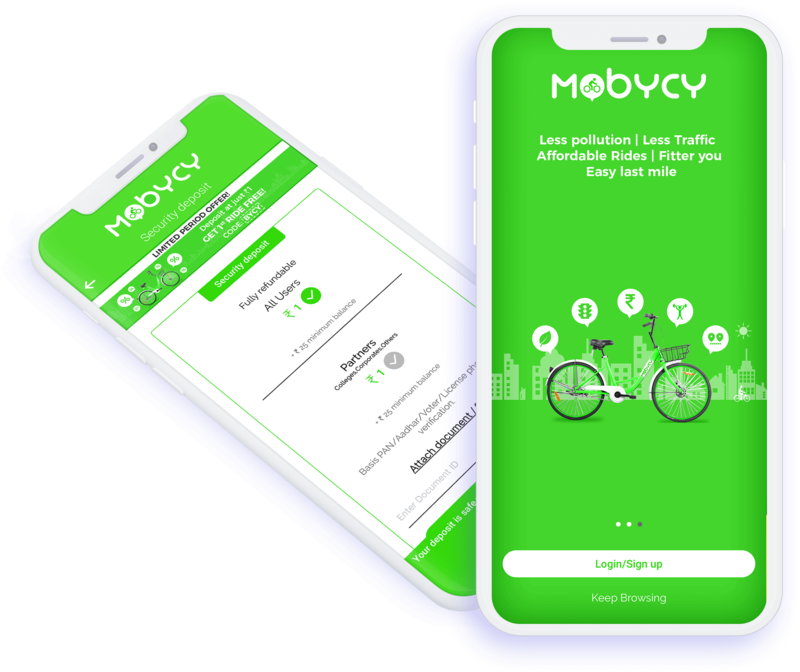 Corporate Plans: For companies looking to expand their CSR plans or for companies looking to provide a last mile commute solution to their employees, Mobycy can provide complete white label bike sharing app solution. Looking to develop your own dockless bike sharing app like Mobycy? You can become an opportunistic entrepreneur by capitalizing on the daily commute market’s need gap. Not only can this business prove to be an extremely profitable venture, by entering this space you are also taking up an environmental cause by decreasing the usage of petrol and diesel operated private vehicles and created a sharing based economy. With a tech partner like us beside you, who can develop a scalable dockless bike sharing application on Android and iOS platforms. You can be rest assured we take the responsibility to make sure your bike sharing app is always running to its optimal state while helping you and your business to grow. An estimated cost of developing a bike sharing app for the Indian market will be in the ballpark of $13000-$15000 (Android + iOS + Web services + Admin). Let’s have a look at the detailed bifurcation based on the features of the app. We can develop analytical tools which will provide insights using user data for your bike sharing application. Predictive analysis will help business owners identify the usage patterns considering factors like time and locations and helps in deriving predictive analysis for the next usage by a specific person or group. For brand partnerships, more sophisticated data provision helps as you can project the route of a user with greater accuracy thereby empowering your partners to target geography specific ads. Depending on the conditions of the public transport, traffic analysis in the area and the number of users active, this algorithm will help you know the rising demand in new localities. Using this data, you can use triggers such as specific offers of that area and capitalize on the demand via a smart bike sharing app solution. The locking and tracking system for each of the bikes will help you ensure the safety of your key assets, the bikes. Our expertise in similar IoT based solutions can help you keep your users in check and maintain the additional layer of security for each of the bikes. What sets us apart to develop a bike sharing app? You may wonder that the first mover’s advantage is already lost to Mobycy. That may not be the right angle to look at this. Be it Flipkart vs Amazon or Uber vs Ola, Indian startup market always has space for great products. Our expert consultants will provide feature ideas to make your bike sharing app unique and scalable for business growth. So, what are you waiting for! Looking for the best bike sharing application development company? How do your ensure safety and security for bikes? We can implement technologies for Admin platforms like fingerprint scanner, QR code technology, smart lock, GPS trackers, OTP code verification and so on according to the choice of yours. Any of this can be added as an add-on cost. What payment platforms you will integrate in my bike sharing application? We have experience in implementing payment integration according to standard country specific platforms(for example- PayTM in India). For global domain, we have extensive experience in implementing Stripe, Paypal and Authorize.net for our client projects. How will the system calculate penalty for late returns? Will you provide maintenance support for my bike sharing app after it is developed? If yes, for how many months? Do you provide a facility to hire dedicated developers for my bike sharing app development project? Have an !dea or need help with your on demand Smart Dockless Bike Sharing App like Mobycy?